Previously operated by Volotea in 2012. Previously operated by transavia.com from 2011 to 2013, with up to 17,000 passengers. Previously operated by transavia.com in 2010, with up to 12,000 passengers. There are historic links between Russia and Biarritz. Frequency of visits by Russian people has been increasing year-on-year (Source: Biarritz tourist board). Swiss tourists are the primary foreign visitors to the seawater therapy centres in the Biarritz area. Operated by Hop! And Etihad Regional in summer season. Potential to maintain the route all-year round. Previously operated by Ryanair in 2012 with up to 17,000 passengers. The diverse landscape of Biarritz is truly inspirational. Whether you crave a beach stroll along the Atlantic, aspire to take in a view of the Pyrenees mountain range, or desire an experience in the green countryside, the area boasts a variety of scenic backdrops. The Basque Country is recognized around the world for its unique and rich cultural heritage. Festivals and events can be experienced throughout the year across the region, including the Festival of Bayonne (pictured here). Nearby San Sebastian has also been designated as the European Capital of Culture for 2016 by the European Union. The Basque Country is known not just for its world-class sports and leisure activities, but also as a place for business. Unparalleled surfing spots, golf courses, hiking trails and even traditional Basque Pelota are at your disposal. Germans are in the top three as foreign visitors to Biarritz region. Previously operated by Ryanair with Frankfurt Hahn in 2008 with up to 25,000 passengers. Volume of Italian tourists has been increasing year after year in the Biarritz region (Source: Biarritz and San Sebastian tourist boards). A premier, leisure-oriented region in France for English tourists. Spanish tourists are the second largest group of foreign visitors in the region and the primary group for owning their second homes in the region. Biarritz’s location near the Atlantic Ocean provides an ideal setting for relaxing spa treatments, including thalassotherapy (seawater medicinal therapy). Of course, Biarritz is known as a business hub as well, ranking as France’s fifth best area for meetings and seminars. 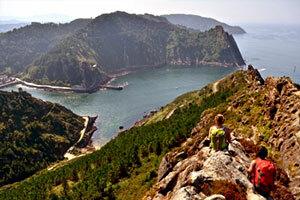 There are 1,000 good reasons to come to the Basque Country! Below are just some of the best ones…we will let you discover the rest on your next visit! From the Landes department to northern Spain, there is a succession of spectacular landscapes and sites encompassing sandy beaches, lakes, cliffs, forests, green countryside and mountains. 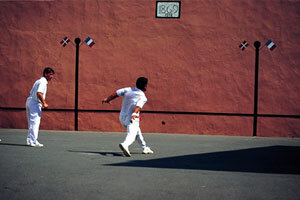 Practically all sports have a place here thanks to the geographical diversity of the area. A European Mecca for surfing, Biarritz attracts amateurs and professionals alike who appreciate the exceptional quality of the waves. 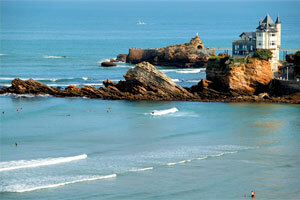 Biarritz is home to a wide array of international surfing schools and training camps. Here, the surf is a way of life and the region is host to many professional surf competitions. With 21 legendary golf courses in the region, all within close vicinity and offering spectacular views, there are endless possibilities to this game. Here, spending time outdoors never gets old. Avid athletes as well as leisurely vacationers can partake in a multitude of activities including cycling, hiking and white water sports. In addition to the boundless line-up of activity, gastronomy is very important in the whole region. Featured cuisine created by world-class chefs, is a fusion of Basque ingredients and origin to the distinctive pintxos. Particularly in San Sebastian, where food is an art form and a large facet of its identity, the standards are set high at 16 Michelin stars. Donostia-San Sebastian’s culinary artists’ traditional and modern interpretation of cuisine, have gained international recognition, becoming the city with the most Michelin stars per square meters in the world. The Basque Culinary Center is prime example of dedication to indigenous gourmet art, with its focus on “new Basque cuisine”. Local traditional markets support and fuel the industry with fresh ingredients from the surrounding land and sea. Visitors to our region will witness no limit to the luxury and relaxation there is to experience. Peaceful natural surroundings set the stage to the variety of health centres and spas located in and around Biarritz, making it the ideal destination to recharge and enjoy a wellness break. With international festivals, Basque fiestas, art exhibitions, markets and trade fairs, surfing competitions or golf tournaments and shows. Featured traditional events include festivals of Bayonne, “San Fermin” in Pamplona, as well as the San Sebastian Film Festival. July is particularly ‘festive’ as there are various music concerts throughout the entire month (Big Festival, among many others). San Sebastian has been designated as European Capital of Culture for 2016 by the European Union. Biarritz is also a city of congresses and seminars, with two centres for professional events, and is active all-year round. Lourdes is only at one hour and 35 minutes driving from Biarritz Airport; the area includes also the pilgrimage route to St. Jacques de Compostela. 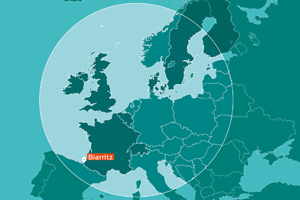 In 2012, Biarritz displayed strong economic performance across its 100,000 companies (+3% from 2011) and 400,000 employees (+1% from 2011). 38,000 companies incorporated in the Basque Country in 2012 (+3.1% vs 2011) creating 130,000 jobs (+1.1% vs 2011). Agribusiness: supports 2,000 jobs across 100 companies. The metalworking sector is responsible for a variety of 3,000 jobs related to this industry (civil engineering construction, steel, etc.). In Gipuzkoa (San Sebastian-province), the largest workers cooperative group in the world “MCC Mondragon”, employed 80,000 people in 289 companies and organizations in four areas of activity in 2012: Finance, Industry, Retail and Knowledge. It represents a turnover of €16 billion in 2008. Emilie and Lydia are in charge of the route development and marketing team. Attractive incentive schemes are offered for new routes. Biarritz Airport’s route development and marketing team is fully dedicated to the development of your airline business, marketing plans and promotion of your products. We offer a variety of support to welcome and promote new routes, such as, press releases and announcements; flight opening press conferences; activities related with an inaugural flight; press trip in cooperation with tourist boards; and workshops with travel agencies. PR support: billboard/outdoor; radio and broadcast; French and Spanish press (including the annual Biarritz Airport magazine); and a variety of experiential events. Online support: web media/banner ads; social media and e-mail campaigns. 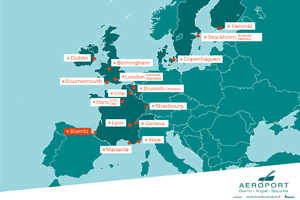 Our tourism partners are keen to support new routes as part of the “Fly Côte Basque” partnership with Biarritz Airport. 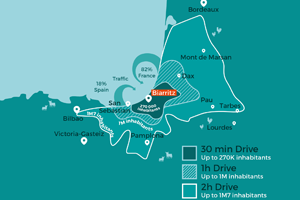 Biarritz Airport is 10 minutes away from Biarritz’s beautiful coastline and city centre, so you can easily access both beaches and businesses. 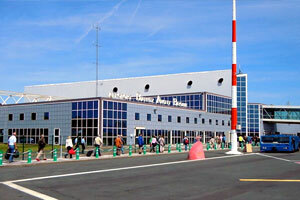 The airport is also strategically located along the Atlantic coast in south-west France near the Spanish border (view an enlarged version of the destinations map). Over the past nine years, the local population has increased by 10% to nearly 1.1 million — outpacing growth for the rest of France. On the business side, the area is home to over 100,000 companies and organisations. Click here to enlarge the map. 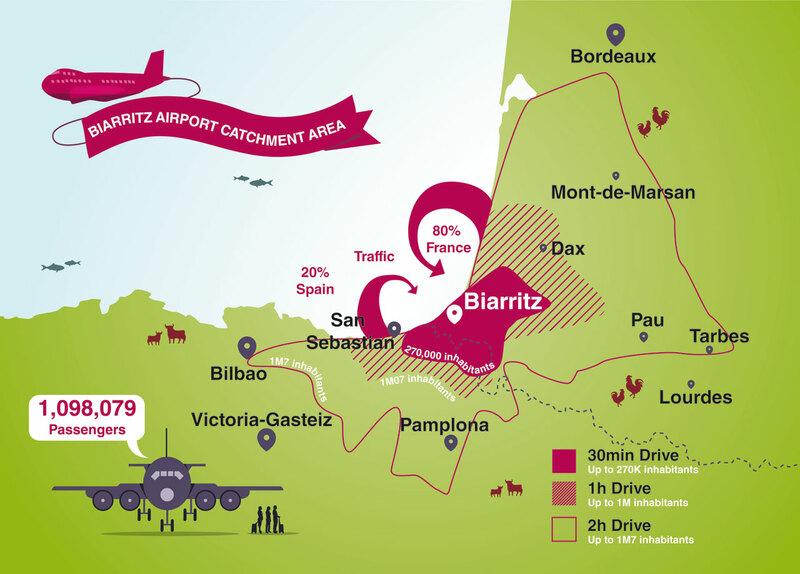 Biarritz Airport offers a catchment area of over 1 million within one hour driving time. The airport’s catchment area spans from the Landes department (90,000 inhabitants) and the Basque Country (285,000 inhabitants) to the province of Gipuzkoa including the city of San Sebastian (710,000 inhabitants). Biarritz Airport doesn’t feature any freight activity. 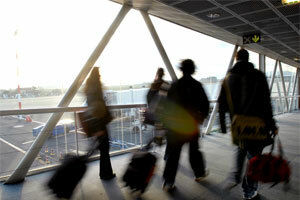 Biarritz Airport welcomed over one million passengers in 2013, representing an increase of 1.3% over 2012 figures. With this growth, the airport is looking forward to expanding and upgrading its arrivals hall, security area, taxiway, and parking facilities. 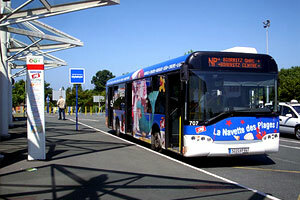 La Navette des Plages (Beach Shuttle) runs during the summer, connecting the arrivals hall with Biarritz and Anglet beaches and with the city centre. In close proximity to TGV and regional rail stations. Other relevant infrastructure & operations details: 1.4 million passenger capacity, largest handled aircraft: 767s and A321s, eight stands, comprehensive airport operations management, 25-minute turnaround, two air bridges, two shops, three restaurants, one VIP room, and four car parks. Expansion of the car parks (2015). 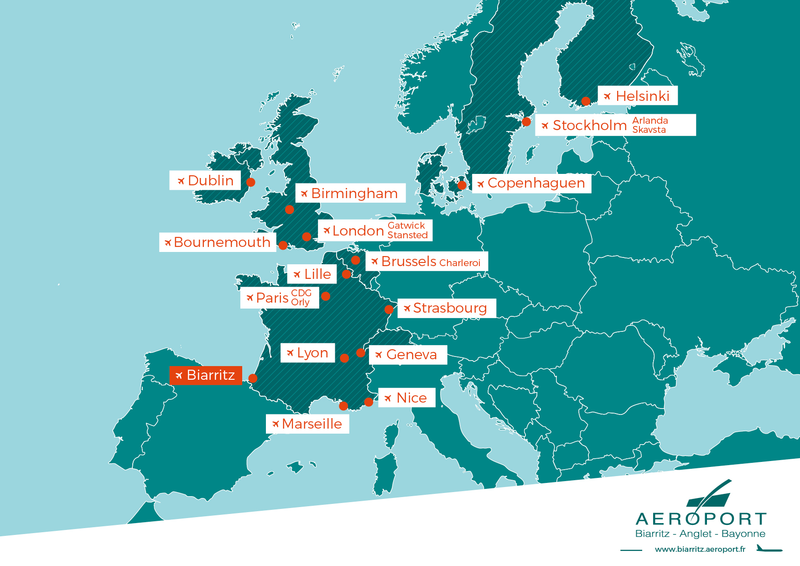 New routes in 2015: Bournemouth and Birmingham with FlyBe; Geneva with Swiss; Lille with Volotea.